Naj over at Iran Facts has been in understandable distress over the tumult in her country, and today abjured my silence. Truthfully, I feel adrift in Iranian internal affairs, but am someone who marvels at the sheer number of Iranians, millions of them, willing to peacefully put their lives on the line in passionate service. Listening to Publicly Traded Media frame the demonstrations this week, you'd think post-election disapproval boils down to a generational dispute. In one corner, we have a forward-looking, freedom-loving Twitter Generation casting away beards and head scarves to square off against a severely backward, unyielding theocracy. While social networks have been useful for the opposition and the authoritarian regime was so blog-darned clueless it thought banning foreign reporters would diminish coverage, the media narrative has distorted the basics in exchange for Packaging...which is, of course, their Job. They have cast the conflict in mythical terms, something like "The Islamic Revolution vs. 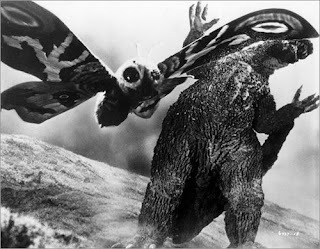 Gay Marriage," when more accurate political Packaging would be Godzilla vs. Mothra. If you wonder what makes modern Iran tick, it doesn't take much poking around to conclude that it's complicated. It's a constitutional democracy, yes, well-functioning at local levels, but also resembles a Soviet command economy and is ultimately run by a Supreme Leader. The leader is a cleric powerful enough to invalidate voting results in an insultingly obvious way, and then publicly decree that the demonstrations will be put down by force. If the Mormon Church ran the US, figuring out the resulting factional dynamics would be next to impossible, but they would be easy compared to Iran's. Few in the West or the East know what goes on behind and between the doors of the Assembly of Experts, Guardian Council, Expediency Discernment Council, or have any insight to the respective rabbinical squabbles and sways over Parliament (Majilis) which commonly result in overturned legislation. As a measure of volatility, one-third of sitting Majili candidates were disqualified from running again in 2008, indicative of a cresting conflict between theocratic and democratic factions. When trying to predict outcomes with sparse data, falling back on fundamentals of the Human Condition is advised. Impulses towards civilization, i.e., living by agreed-upon rules conducive to peace and harmony, often clash with wills to power. There is constant tension between individuality and groupthink, rationality and emotion, morality and immorality, and there are simple questions. Who has power? What are their motivations? Hashemi Rafsanjani is Iran's richest man. A former President, he chairs both the Assembly of Experts and the Expediency Discernment Council; he is rumored to have resigned from the latter body last week, one tasked with mediating disputes between the Supreme Leader and Parliament. His nickname is "Shah," he is a pro-business free-marketeer hostile to the current President's isolationist policies, and he sent an open letter to Khameini, the Supreme Leader, a week before the presidential election warning of vote fraud consequences. The wronged opposition candidate (Mousavi) is a pragmatic and open to rapprochement with the West, yet seems to be unacceptable to both Khameini and, for the moment, to Rafsanjani. Khameini, Iran's first post-revolution President and survivor of a 1981 assassination attempt, has a history of violent repression and executed thousands of dissidents. Rafsanjani can now use Khameini's response to popular protests as a reason for dismissal in his capacity as Chairman of the Assembly of Experts, which has the constitutional power to elect and oust the Supreme Leader. Mere logic is often unreliable in these things, but Rafsanjani appears to be angling toward installing himself or a proxy as Supreme Leader. The basic structures seem unlikely to change, and Mousavi's appeal for a return to uncorrupted revolutionary principles is similarly unlikely to occur (see Naj's translation of his remarkable letter), but his appeal will bear strong offspring. Theocracy is intransigently shooting itself in the foot, hollowing out its authority and provoking conditions for a long arc towards modernism in elected offices with less direct control of church over state. Politically, the next tactical step would be commercial back-channel communications by Rafsanjani's son, the head of Gaz-Iran, to the Obama Administration on nuclear and energy issues. Rafsanjani is a firm supporter and direct beneficiary of the nuclear power generation program, appreciates its implied effects on Israel, and would almost certainly trade close monitoring for shifting administration contracts to US suppliers. While innocents protesting election fraud are gassed, beaten, shot, and photographed for future detainment, this is the cold-around-the-heart door they're making it possible for Iran to walk through. If such is done, Iran will immediately be immunized from attack by Israel and the unbalanced scales of power in the region would swing towards equilibrium. While sometimes achieving desired results, naked applications of force are expensive and unreliable. As of today, Iran's Supreme Leader set a host of unintended and, for him and the current regime's supporters and enemies, undesired consequences in motion. Having known and abetted the protests which brought down the Shah in 1979, resisting the will of the people is a Supreme Irony. It's easy enough to ignore your difficult-to-figure-out illustration, but the reference to gay marriage in your title tends to subvert your sober-minded analysis of Iran's politics. While somewhat ignorant of the going's on, having been out of town and out of touch for the past week, I can still smell a much-needed revolution in the air. this is a very plausible analysis Marc, thanks! Nevertheless, I suspect this time around, all Mullah's, including Hashemi are trembling in the wind of public anger, and courage in defying their legislated death sentence, when they shout death to Khamenei ... we MUST empower the people by commending their courage, and if we do that, the next dictator will be surely more careful! It's there because of the style of press coverage here, delivered with techniques similar to what's employed in the gay marriage conflict. And Iran has now been explicitly criticized in the US press for its treatment of gays. I agree it's confusing and unannotated, so moved it out of the title and into the text. Anyhow, the Iran coverage here is designed to generate a purely emotional response, to an extent that I find it laughable. thanks! Revolution is the bottom line, and it may move that direction. Hard to tell; the current regime seems to have far more support than the Shah did, but it needs to moderate. that's what I can't figure out--the mullahs, of all people, should best know not to mess with the Iranian will. Yet they're doing it, and every death makes further resistance more likely, not less. They don't seem to get it. I will add, however, that the mullahs' early restraint was remarkable. Spontaneous protests of similar size and expression could not occur in the US without an immediate and overwhelming government response, which makes the condescending news coverage nauseating. I'm thinking Naj is right. The Mullahs have gotta be shaking in their shoes. yes, bouncing back and forth between too soft and too hard signifies sphincter arrest. But it's probably not revolution the body politic can agree upon, just more honesty and gradual reform instead of a stone wall. The mullahs do not know how to artfully give ground, but Rafsanjani does, so I centered the post on him.